With Tyvek® suits you do not ever need to compromise because Tyvek® suits deliver the best balance of protection, durability and comfort of any protective suit. 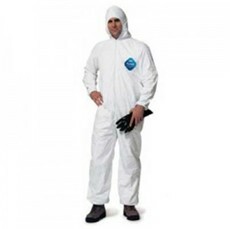 Tyvek® suits are made using a proprietary manufacturing process, That features an inherent barrier only found with the Tyvek material from Dupont. Unlike other protective apparel fabrics that do not qualify for use in the EPA's RRP lead renovation program, that have either a film or coating that can be easily scratched or worn away. Tyvek® provides a barrier through the entire fabric. As a result, your protection is not compromised unless the fabric has been completely torn which is a very difficult thing to do because of the strength and durability of Tyvek® which is a registered trademark of Dupont.